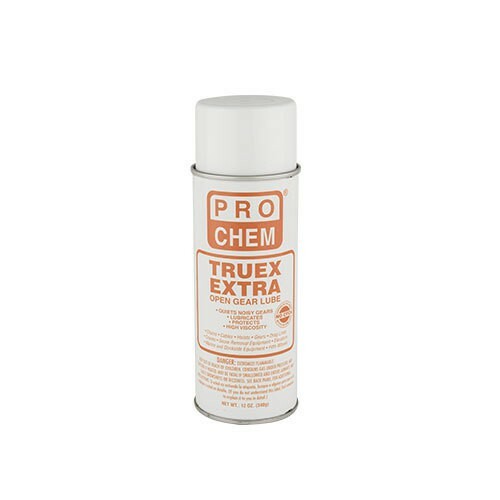 Truex Extra | Pro Chem, Inc. This extra-heavy viscosity lubricant penetrates deep into gears, cables and heavy mechanisms, imparting a very tacky, black adhesive lubricant. Prevents corrosion and resists oxidation by repelling moisture. Can be used in extreme weather conditions and underwater. Product is fortified with Molybdenum disulfide to provide a cushion of lubricant between gear teeth and other surfaces. It is perfect for 5th wheels due to its wear-resistance and adhesion. Reduces down time and noise due to metal-to-metal contact. Shake well before using. Remove protective cap. Hold 6-8 inches from surface and apply an even coat. Turn on machinery and allow lubricant to spread over working surfaces. Apply a second thinner coating to ensure adequate lubrication. Reapply as needed to lubricate and protect equipment. After spraying, turn upside down and spray until nozzle is clear.